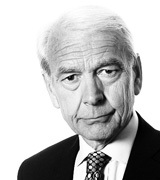 John Humphrys - Defending Britain: Are We Spending Enough? January 23, 2018, 3:27 p.m.
It’s not uncommon for our military top brass to plead for more money to run the armed forces. But it is unusual for the head of the army, backed by the defence secretary, to say in public that things have reached such a pretty pass that Britain might no longer be able to defend itself against Russian aggression. That, in effect, is what General Sir Nick Carter, the head of the army, claimed in a much-trailed speech on Monday. Is he right? And if so, should we give defence top priority in the rationing of scarce public spending, or should we listen instead to the Foreign Secretary, who told the Cabinet a day later that it’s the NHS that really needs the money: an extra £5bn a year? How much to spend on defence used to be a relatively simple matter. When the British Empire was top dog we spent a lot. Then two world wars crippled us and we had to cut back. Our global reach shrank in the 1960s when we pulled back from ‘east of Suez’, leaving the Americans as the world’s policemen. We sheltered within the NATO alliance, relying on the American nuclear umbrella as the ultimate defence against the palpable enemy of the Cold War era, the Soviet Union. When that collapsed we thought (along with most of our neighbours in Europe) that we had ‘won’ the Cold War, that peace and harmony would now break out and that we could afford to reduce the scale of our military forces and save a lot of money. So we did. But nothing ever stands still for long and things did not turn out quite as planned. China emerged to become a superpower. Terrorism produced atrocities that led our leaders to engage in military ventures that proved costly and destabilising. The Middle East continues to be reshaped through conflict and war in ways that may one day require us to involve ourselves militarily. And most of all, Russia has reasserted itself. President Putin has rebuilt his country’s armed forces; has seized Crimea and meddled in eastern Ukraine; has rattled sabres on NATO’s northern borders in the Baltic and buzzed his submarines and fighter jets even round British shores. Less conventionally, Russia is now regarded as a major cyber threat and there is growing evidence of its interference through social media in western elections, notably the 2016 American presidential election and maybe also in Britain’s referendum on leaving the European Union. It was to this pervasive threat that Sir Nick Carter turned his attention on Monday. He said: ‘Our ability to pre-empt or respond to threats will be eroded if we don’t keep up with our adversaries.’ He went on: ‘The threats we face are not thousands of miles away but are now on Europe’s doorstep. We have seen how cyber-warfare can be both waged on the battlefield and [used] to disrupt normal people’s lives. We in the UK are not immune from that.’ He cited the example of Russia launching 26 cruise missiles from submarines 1,500km away during recent action in the Syrian conflict and spoke of the pervasive Russian threat as a sort of contagious virus that can be upon us before we realise it. He said: ‘We must take notice of what is going on around us or our ability to take action will be massively constrained. … The time to address these threats is now – we cannot afford to sit back’. General Carter is not the first serving military chief to express alarm at the current state of our defences but his speech was perhaps the most direct. Others have drawn attention to another aspect of the predicament faced by Britain and Europe: the uncertainty of America’s continued commitment. President Trump has spoken of NATO as an ‘obsolete’ organisation and has hinted that the United States might sharply reduce its presence in Europe unless Europeans pick up more of the defence tab. General Carter announced on Monday that the return of the last 4,000 British forces stationed in Germany, due to take place in a couple of years, has been put on hold. General Carter’s warnings come in the context of a financial crisis in the Ministry of Defence. It faces a £20bn deficit and when he first came into office in the autumn, the new Defence Secretary, Gavin Williamson, was confronted with a variety of unpalatable options. There were proposals to slash the army by 11,000, the marines by 2,000 and the RAF by 1,000. He has bought more time for a deeper review. His predecessor, Sir Michael Fallon, said this week that the annual budget needs to be increased by £7.7bn. To some, all this is no more than special pleading, no different in itself from doctors wanting more money for hospitals or teachers for schools. What makes it significantly different to some is that the nation’s very survival is at risk. They argue that much of the MoD’s problems derive from what they regard as ludicrously costly decisions taken in the paste either because of a harking back to Britain’s days of global glory, or simply to create jobs and buy votes. Or, perhaps, both. They point to the commissioning of two aircraft carriers by the last Labour government, each costing £3bn but which will be hard to use effectively because of problems with the compatibility of the American fighter jets commissioned to fly from them. Sorting that little difficulty out will cost hundreds of millions of pounds and in any case, the critics ask, what does a country like Britain need aircraft carriers for any more? Then there is the cost of renewing Trident, Britain’s nuclear deterrent. At £31bn, they argue, it is a massive drain on the defence budget. Some argue that it should be taken out of the defence budget altogether but others says it’s all a waste of money and Britain’s nuclear deterrent is no more than a prestige project, designed to show we can ‘punch above our weight’ but with no military value at all. At the most radical end of the critique of orthodox military thinking is the argument that conventional military forces aren’t where it’s at any more. We should not be too bothered about tanks and troops on the ground, they say, because the battleground that matters these days is in cyberspace. In that context, why do we need much of an army at all? The retort to this is not to deny the new nature of the threat but to say that it simply adds to the threats we are facing and we must to counter it too. The fact that we may face a cyberattack (and the head of the UK’s National Cyber Security Centre, Ciaran Martin, said recently it’s a matter of ‘when, not if’) does not mean that we do not also face more conventional threats. And in a world of nuclear proliferation, it would be mad, according to Trident’s defenders, for Britain unilaterally to abandon its nuclear defences. There is, of course, no limit on what a country might spend to defend itself. But General Carter and those who think like him argue that it is not simply that they want to spend more because obviously they would; it’s that in the post-Cold War era of relaxed tension we have allowed our defences to become dangerously weak while our adversaries have done the opposite. In the end it is for politicians not generals to decide how to spend public money and General Carter’s case will not have been helped by the Foreign Secretary, Boris Johnson, letting it be known before Tuesday’s Cabinet meeting that he wanted another £100m a week spent on the NHS. No doubt Mr Johnson would say that he’s in favour of increased defence spending too, but the Chancellor might then point out that money doesn’t grow on trees. So what priority should we give to defence spending? What do you think? Do you think we should take General Carter’s warnings seriously and make defence spending our priority? Or do you think it’s just special pleading and that there are more important things to spend scarce taxpayers’ money on?